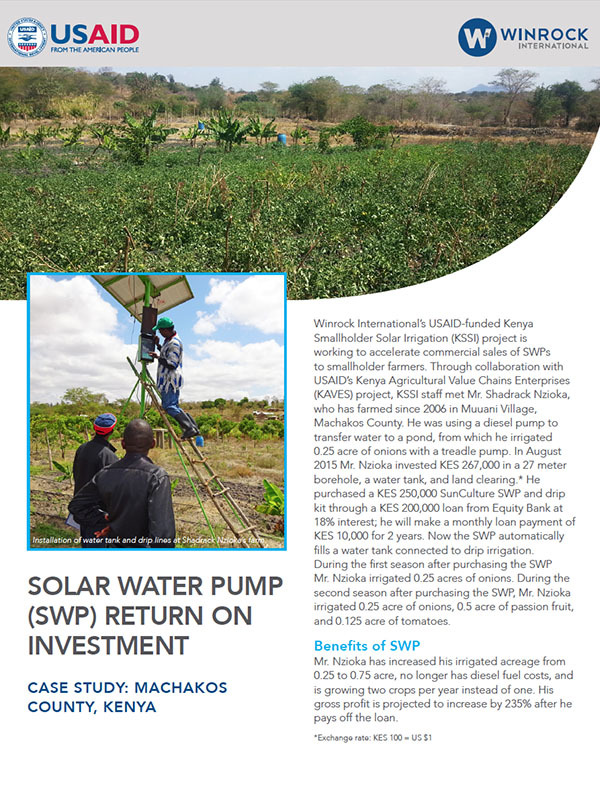 Winrock International’s USAID-funded Kenya Smallholder Solar Irrigation (KSSI) project is working to accelerate commercial sales of SWPs to smallholder farmers. Through collaboration with USAID’s Kenya Agricultural Value Chains Enterprises (KAVES) project, KSSI staff met Mr. Shadrack Nzioka, who has farmed since 2006 in Muuani Village, Machakos County. He was using a diesel pump to transfer water to a pond, from which he irrigated 0.25 acre of onions with a treadle pump. In August 2015 Mr. Nzioka invested KES 267,000 in a 27 meter borehole, a water tank, and land clearing. * He purchased a KES 250,000 SunCulture SWP and drip kit through a KES 200,000 loan from Equity Bank at 18% interest; he will make a monthly loan payment of KES 10,000 for 2 years. Now the SWP automatically fills a water tank connected to drip irrigation. During the first season after purchasing the SWP Mr. Nzioka irrigated 0.25 acres of onions. During the second season after purchasing the SWP, Mr. Nzioka irrigated 0.25 acre of onions, 0.5 acre of passion fruit, and 0.125 acre of tomatoes.